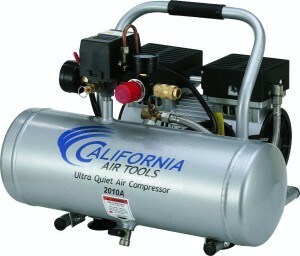 The California Air Tools 2010A Ultra Quiet and Oil-Free Compressor is one of the quietest heavy duty compressors. The package includes the air compressor itself, 2 gauges for pressure monitoring and a 1/4’” universal quick connector. The tank only takes 50 seconds to fill up. The pumping system produces compressed air at a maximum pressure of 120 PSI and a CFM of 3.10 at a pressure of 90 PSI. A very powerful motor with a rated power of 1.0 HP and a peak power of 2.0 HP is mounted onto the compressor for superior air quality. This motor requires a power supply of 110 volts at a frequency of 60 Hz. It can be plugged into the garage power outlet very easily. The four-pole motor has a running speed of 1680 RPM. 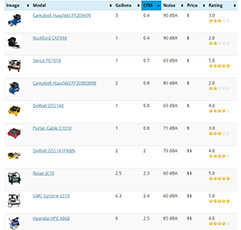 This is considerably slower to reduce noise and wear and tear of the components. Filling the tank when empty takes 50 seconds. The compressor can recover from a pressure of 90 PSI up to the maximum of 120 PSI in exactly 14 seconds. The pump used is oil free with a large piston (dual pistons). The cylinder is made of cast aluminium; the cylinder rings are made of Teflon with dual plate valves. Reed valves are cast from stainless steel to make it rust resistant. Rated at 60 dB, this product is quieter than most conversations. Slow moving motor parts produce very low sounds. It might not be the quietest but is down there with the best. This equipment is ideal for anyone who works in an environment where compressor noise becomes a disturbing issue. The oil-less pump can run in even areas of extreme temperatures and non-uniform terrains. If you need to drive brad nails, finish nails, light surface finishing and carpentry work, then look no further than this. It is quieter than lots of vacuum cleaners. Has thermal protect from overloads. The power cord is kind of short, at 4 feet. Customer service is not very great. The California Air Tools 2010A Ultra Quiet and Oil-Free is a decent compressor capable of running lightweight air tools quite well. Its shortcomings arise when you want to operate tools that need more power.